As I hit the hiking trails on a beautiful spring morning earlier this year, I couldn’t help think how nice it would be to camp along those trails later in the summer. There was an abundance of fallen trees for firewood, likely from a massive storm that had hit the area recently, so it seemed like the perfect spot. Of course, chopping those trees up into firewood could pose a challenge. A lightweight chainsaw that I could carry with me would be ideal. A powerful machine that can handle just about any piece of wood really wouldn’t be necessary. There are many different chainsaw models to choose from and while prices may be somewhat of an indicator of the quality of the machine, it isn’t the only thing to consider. In the circumstance I described above the weight of the chainsaw was also an important factor. 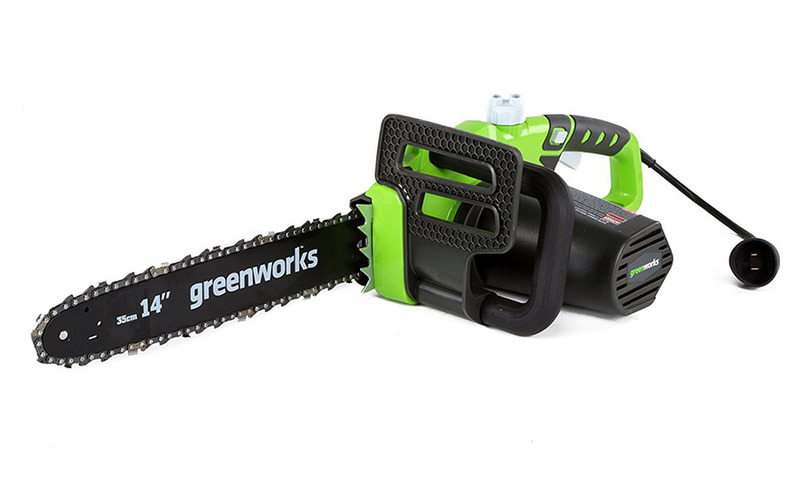 An ideal chainsaw for such an excursion would be the GreenWorks 20222 Corded Chainsaw. Surprisingly, this chainsaw retails for well under $100, making it one of the most affordable options on the market today. The one main flaw in my plan for using a chainsaw like this on a hiking trip is that it happens to be a corded model. Unfortunately, there aren’t too many places with electrical outlets along the hiking trails I visited. That doesn’t mean it’s not an ideal chainsaw for regular small work around the yard though. Being that it’s an electric chainsaw and starts with a simple push of a button – there are no cords to pull on so you don’t have to worry about wearing your shoulders out quickly. This chainsaw isn’t meant to be used on large industrial jobs. If you cut down trees for a living then you probably won’t want to make this chainsaw the main tool in your arsenal. It is ideal as a backyard chainsaw for some basic pruning and for cutting small branches. You won’t really want to use it on any bigger jobs as it only has a 14-inch blade bar which isn’t designed for cutting large logs. I’ve used chainsaws many times, and the one thing that happens more often than you’d like is the chain working its way loose. In the past this meant having to pull out your tool chest so that you could find the right tools to adjust the tension. These days with a modern chainsaw such as the GreenWorks 20222 you have access to tool-less tension adjustment so that you can quickly get back to work. A chainsaw is a tool that you need to have a good grip on if you’re going to be able to operate it properly and safely. This GreenWorks chainsaw is equipped with a wraparound handle that’s both comfortable to operate and designed with safety in mind as well. It has a debris guard that protects your hands from flying chips of wood while you work. I’ve had the displeasure of getting hit by a splinter of wood from a chainsaw and it wasn’t an enjoyable experience, so I was happy to see that they’ve included this feature. While auto oiling features are common on some of the more expensive chainsaw models on the market, I was surprised to find that it’s also included in this entry-level model. The chainsaw will automatically lubricate the blade with the oil to ensure it keeps working as efficiently as possible. You do have to supply the oil yourself and make sure its topped up, but as long as you do your part the machine will do the rest. As we’ve already mentioned this isn’t the largest chain saw on the market – it only has a 14-inch blade bar. That doesn’t make it ideal for large jobs, but because of its compact design it is also very lightweight. The 20222 Corded Chainsaw weighs in at a very manageable 8 pounds. As you wield this thing in your backyard, pruning branches and chopping up small firewood logs, you’ll barely notice the effect on your shoulders at all. If there is one area where GreenWorks shines over other outdoor power equipment manufacturers it’s in the warranty they provide. All of GreenWorks products come standard with a four-year warranty. This is more than double the industry standard and definitely adds to your peace of mind. When you purchase this chainsaw you can be comfortable in the knowledge that it will either keep working effectively for at least four years, or you’ll be able to get it fixed by the manufacturer at minimal cost to yourself. While it’s hard to argue that this chainsaw isn’t a great deal, you’ll still have to put up with the fact that it does have a cord. With a corded model like this you don’t have the freedom to go anywhere like you do with a gasoline-powered chainsaw or a battery-powered option. As long as you have a long enough extension cord to reach around your yard it shouldn’t be a major deal, but it is something to keep in the back of your mind. The biggest complaint that critics have when it comes to this chainsaw is the fact that the chain seems to have difficulty staying on the machine. For people who have experienced this problem, it seems to happen continuously just about every time they use the chainsaw. Considering the chain is one of the most important features of a chainsaw, this is more than a little worrying – although in fairness it should be pointed out that most users that have purchased this chainsaw have been satisfied with their purchase. While the problem that some people have had with keeping the chain attached to the GreenWorks 20222 Corded Chainsaw on a consistent basis is cause for concern, its impressive warranty and small price tag are reasons for optimism. I like the fact that it includes an automatic oiler and a tool-less tension adjustment feature, which are both things you would normally find on a much more expensive model. If you’re in the market for an inexpensive chainsaw that can get the job done, this is one that’s worth checking out.